and activate brain science ! Make invisible gene expression visible and share the information ! A recent progress in genome biology has had a huge impact on our view of life and now enables us to use these biological information for improving quality of life. The number of hereditary diseases, caused by a tiny change occurring somewhere in 30 million base-pairs of the human genome for each disease, is now comes up to 2,000 or more, although each disease is rare in the population. Moreover, susceptibility of common diseases is expected to be statistically understood as a combination of multiple (sometimes a large number of ) tiny changes in the genome, certainly environmental factors need to be seriously considered. In order to increase practical availability of knowledge of genome biology for the purpose of managing these diseases and improving quality of life, information of bio-molecules, in particular genes, which are copies of parts of the genome as functional units, needs to be analysed how they are produced and functioning in the cells, tissues, and organs along with the anatomical information. And the information needs to be shared among researchers to activate innovation. The brain, especially, has a complex anatomical structure and highly differentiated and organized functions. Therefore, successfully understanding of the brain requires sophisticated technology of computation for the integration of neuroscience with information sciences: neuroinformatics. To rise to this integration, OECD launched International Neuroinformatics Coordinating Facility (INCF). "INCF develops and maintains database and computational infrastructure for neuroscientists. Software tools and standards for the international neuroinformatics community are being developed through the INCF Programs. 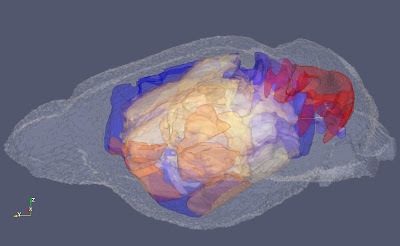 The INCF Digital Brain Atlasing Program is now integrating atlases of the rodent brain at different biological levels, from gene activity to large-scale structure, using a standard coordinate space (Waxholm space: http://www.incf.org/programs/atlasing/projects/waxholm-space). Supporting this aim is the associated Digital Atlasing Infrastructure, which facilitates access to a large range of spatially disparate data and tools. Using the latest computation technology, you can do research in the virtual web space. Presence of genes is invisible, however they carry important information of the basic brain function. Making invisible gene expression visible and discover something new on the web. Data and Tools Sharing in the standard coordinate Waxholm Space (WHS) on the web organized by INCF. Create bio-molecullar data-sets for brain atlasing using Transcriptome Tomography. creating 100 times more precise data than existing data-sets in ViBrism for gene expression atlas of the adult mouse brain. analyzing developmental stages through embryos to the adult using underlying transcriptome (whole coding and non-coding genes) features of the mouse brain. eliciting differences and similarities of anatomical structure, function and underlying transcriptome features among the brains of human and other species. creating databases for proteins, sugars and lipids expression atlases. Based on anatomy ontology and gene ontology, statistically analyze expression data. Developing interface for the visualization and making resources easy to manipulate and understand for many people.